When I was a wee child in southern England, a harvest festival meant going to church with a bag of nonperishable goods and a punnet of tomatoes to sing some hymns at the start of autumn. 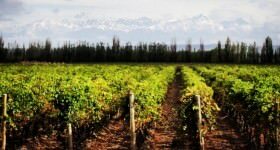 But in wine-producing province Mendoza, harvest is so much more than a 90-minute celebration in the local parish. 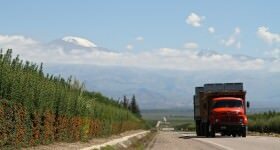 Vendimia or “grape harvest” holds huge importance in all 18 corners of the province, bringing together mendocinos from Malargüe in the south to Rivadavia in the east and Luján de Cuyo in the west. Named one of the top 10 harvest celebrations in the world by National Geographic, the main aim is to give thanks to the patron saint of grape harvests, the Virgen de la Carrodilla. Besides that and a tiny religious experience thanks to a letter written by Pope Francis himself at the Bendición de los Frutos blessing, Vendimia then turns into one long party, Mendoza style. In 2014 the official festivities lasted 11 days, peaking with a weekend extravaganza from 7-9 March. 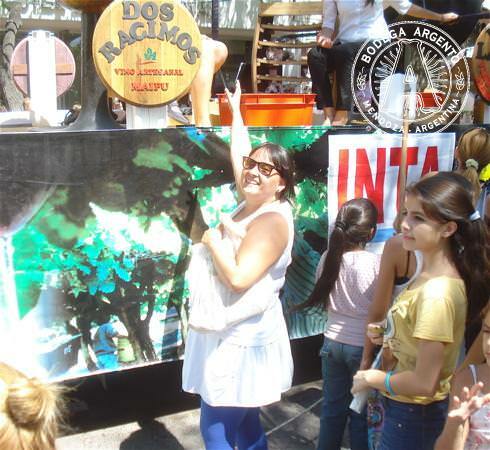 The Real Argentina was there to wave at the queens, catch pieces of fruit and of course celebrate the meaning of wine. Anabel Níscola from Maipú; photo courtesy of Park Hyatt Mendoza. 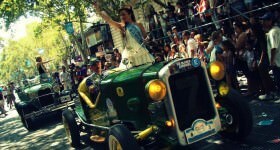 Mendoza has officially celebrated the grape harvest since 1936 and choosing harvest queens is a simultaneous part of the festivities. And it’s queens plural because each of the 18 districts selects their sovereign, who then goes head to head against the other 17 to become the national (elected) monarch. It’s the people’s choice when it comes down to selecting their beauty and grape harvest queen, and it was a genuinely tight call between this year’s winner and her runner-up. María Agustina Cano from Tupungato ranked a close second but it was the slightly more lovely blue-eyed brunette Sofía Haudet from Guaymallén who seized the sceptre from Candela Berbel, 2013’s queen from Malargüe. 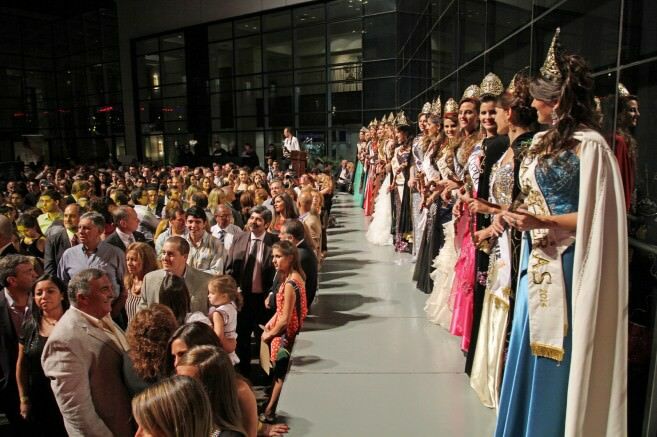 All the queens of Vendimia 2014; photo courtesy of Park Hyatt Mendoza. 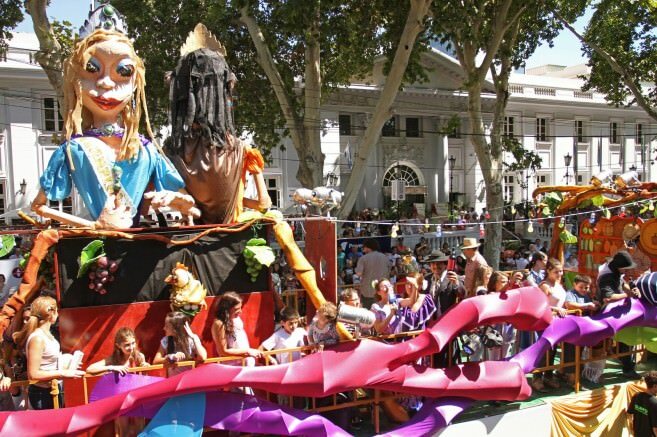 Two main parades took place – the nocturnal Vía Blanca de las Reinas and the Carrusel de las Reinas, parties on wheels which close down some of the main arteries in Mendoza city. 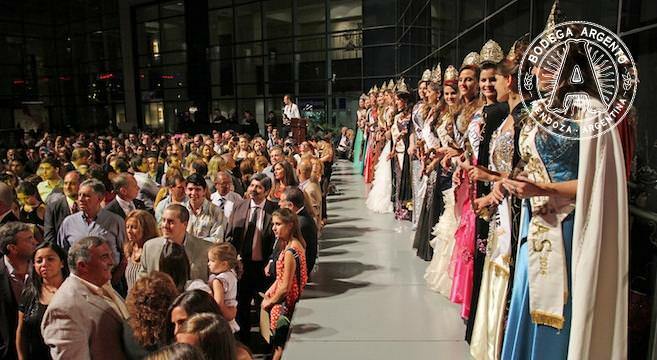 Vía Blanca, which kicked off at about 9pm on the Friday night, offers a first glimpse of the 18 queens hoping to take the title of national grape harvest queen as they slowly paraded the streets on themed floats representing their district. This was also the first time that the passion for Vendimia bubbled to the surface. With temporary bleachers lined up on Plaza Independencia in front of the Park Hyatt hotel, crowds lined the streets awaiting a glimpse of their favourite girl. With announcers bellowing introductions – “presenting Nandy from Junín” and “Anabel from Maipú”, the screams were on a par with Justin Bieber’s fans. Dancers, performance artists, babies, horsemen and of course district-appointed monarchs pottered around central Mendoza atop honking lorries competing with emotional regal speeches and pumping dance music. The atmosphere was lively and often boisterous, and gave a real sense of how Mendoza celebrates Vendimia, verging on carnival style. 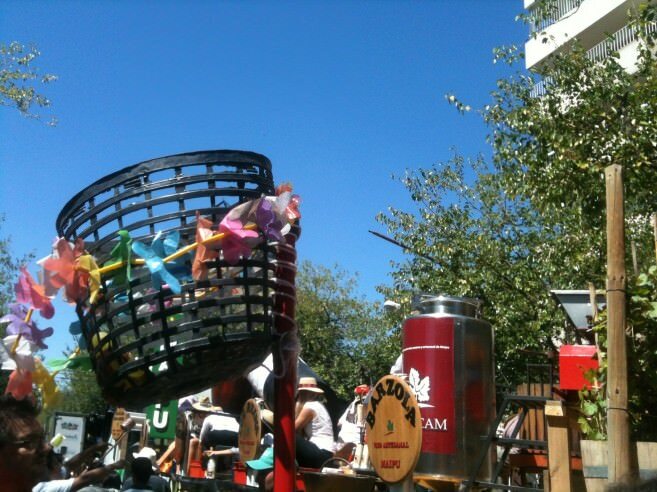 A float passes by Plaza Independencia; photo courtesy of Park Hyatt Mendoza. Kicking off bright and early at 9am on the Saturday, the Carrusel actually brought a tear to my eye, so strong was the sense of pride oozing from every participant’s pore. 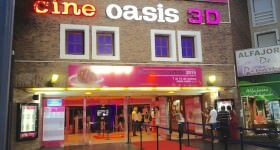 While Vía Blanca is essentially about illuminating the beauty of the harvest queens with flashing lights, Carrusel is the completely inclusive part of Vendimia. From gaucho associations to folk music dance troups, to revellers on horseback and elderly gauchos perfectly turned out with polished coin belts and immaculate long leather boots, it did make me wonder: “If so many mendocinos are participating, just who exactly is watching?” This was also the time for the festive spirit of Carnival to kick in, with plenty of sequins, face masks and booty shaking, throwing in a pagan element to the celebration. One really fun part of Carrusel is the fruit-throwing, which is taken very seriously by those waiting patiently with baskets or nets on sticks to catch local produce. Districts give away some of their most typical goods; Luján de Cuyo, for example, dispatched some rather lethal honeydew melons (lethal when they’re thrown, that is), while Guaymallén helped stock up fridges with garlic, aubergine, pumpkins and strangely, packets of crisps. Basket to catch fruit; photo by Sorrel Moseley-Williams. 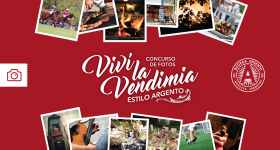 This is the moment for everyone from across Mendoza who is proud of their roots and cultural heritage to join in, and that included the elderly cyclist who pedalled the parade circuit with his pet goose in his basket, and the protesting vineyard workers demanding higher pay. I even caught a couple of red apples, and very tasty they were too. Sorrel reaches out for some fruit! Photo by Allan Kelin. The main event Saturday night saw all the votes counted to elect our Sofía Haudet as queen for a year, but it’s also another moment that includes much participation from mendocinos around the province. Hundreds of folklore dancers and artists took to the stage of the Frank Romero Day amphitheatre, located in the Andean foothills, to act out Vendimia history in a fantastic extravaganza of costumes, music, colours and regional representation – think Las Vegas on wine. Live music over the weekend included Mexican crooner Armando Manzanero (he lunched at the same winery as me on Sunday, causing many of the waitresses to swoon), while Argentine rockers Babasónicos closed proceedings on Tuesday night. Vendimia has come a long way since its 17th Century beginnings when peasants would simply give thanks to the Virgen de la Carrodilla, so “salud!” and here’s until 2015. Mendoza, located in the mid-west of the Argentine Republic and at the feet of the Andes, is Cuyo Region’s most important city. With over 1,6 million inhabitants, it is the country’s 4th largest city. Its exceptional climate allows the bests grape to ripen, basis for its excellent wines. 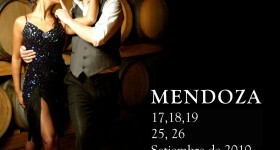 Mendoza is the center of Argentina’s wine industry and accounts for approximately 70% of the country’s total output. Nearly all the major wineries are concentrated in this province. Its signature grape is the Malbec. 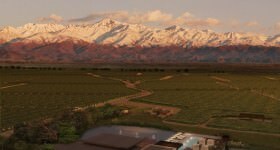 The climate and terroir in Mendoza are the ideal setting for the full expression of this grape variety. The beauty of Mendoza’s downtown is phenomenal. What is most peculiar is its network of water canals that have transformed what was an arid region into an awesome spectacle of blossoming trees that completely surround the city. The Andes Mountain Range offers endless attractions to tourists, where the Aconcagua Mountain (North and South America’s highest peak – 6,962 meters above sea level) is the star. 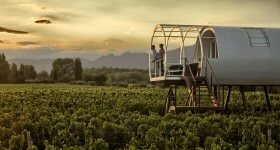 Mendoza is ideal for family travelers, outdoor enthusiasts, adventure seekers, or those just looking for a relaxing getaway. Wherever you choose to explore in this magnificent state, you’ll find spectacular scenery, fun things to do and friendly, helpful people. You’ll also find a place that’s unhurried, unspoiled and unassuming.